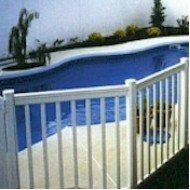 A gate to match the Royal Vinyl Pro picket fencing system, 36 inches wide, and in white to match the..
Picket fence style stair section for use with Royal Vinyl Pro caravan picket fencing system. Ideal f.. Hollow Square White Post Caps for the above posts. External size - 95mm x 95mm Internal size (..
Can be used with timber inserts below the deck to cover the timber in PVC, or use instead of the abo.. Corner Post Kit For panels. This post is galvanised steel with a base plate for easy installation, ..
In-Line post Kit For panels. This post is galvanised steel with a base plate for easy installation,..
End Post Kit For panels. This post is galvanised steel with a base plate for easy installation, eac..
Stair brackets for top and bottom rails on stair section, only available in white. Internal size ..
Stairs two treads pre-made metal frame (cannot be sold with out hand rails) Price is for the steps..
Stairs two treads pre-made metal frame (cannot be sold with out hand rails) Price is for the steps ..
For that finishing touch, why not add a Globe Lantern to your picket fencing, enabling you to stay ..
For that finishing touch, why not add a Coach Lantern to your picket fencing, enabling you to stay ..